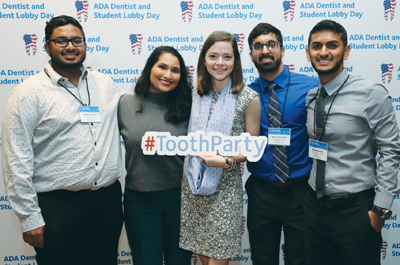 Dental Students and Dentists Gather Together in Washington D.C. For Massive "Tooth Party"
During March 26 – 28, 2017, hundreds of dental students and ADA dentists lobbied together in Washington in the first of its kind gathering, whose theme was “One Voice United”. In what is expected to rank as the largest and most successful advocacy event for any healthcare association in 2017, the purpose of the gathering was to make legislators realize just how important oral health is to overall health. During this unified 3-day period, known as the “Tooth Party”, dentists learned exactly what it means to be a dental student these days, where the average debt per graduating senior is $262,000. The consensus from the students was that “Something has to change”, and discussions centered on whether loan payment programs was the answer. Perhaps expanding refinancing opportunities was another possibility. Dental students also got to take a break from their studies and were able to meet with legislators so they can explain what’s on their minds. Sessions such as “How to Meet with Your Member of Congress” provided tips for dentists and dental students on how to get the most out of their office visits, including role-playing exercises. Many mutually felt that they learned so much from each other, and that it helped them to understand the power the dental profession has, especially when dentists and students came together from all over the US to make an impact at the national level. For more information about this event, click HERE. Additionally, you can search twitter under the hashtag #toothparty for more photos and information. The dental industry is definitely a dynamic industry to be a part of. Upload your resume or use our free resume builder at DentalWorkers.com and let us help you become part of it!